First Line:"I hate First Friday"
Review: I don't even know where to begin with this review. Red Queen was incredible and anyone who hasn't read it yet needs to go and do so right now. The book is a dystopian fantasy with two main groups of people. The Reds and the Silvers. The Reds have no real value they are powerless and subject to the Silvers cruelty. Silvers on the other hand have these Xmen-esque type powers and they are considered to be like gods who live in full luxury. With a revolution on the rise and a simple Red girl somehow having powers that only Silvers should possess things get really interesting pretty quick. Mare Barrow's life is already screwed up just by being a Red but once the royal family discovers she has powers that they can't explain away, they give her a new identity as a Silver and she either goes along with the charade or they kill her. I loved Mare, she gets thrown into a world she knows nothing about, she is in constant danger from discovery of her true identity and to top it all off she meets two princes both seeking her affection. Yes there is a love triangle of sorts but luckily it all gets nipped in the bud so don't let that stop you from reading Red Queen. The world created by Aveyard was cruel and beautiful all at once. 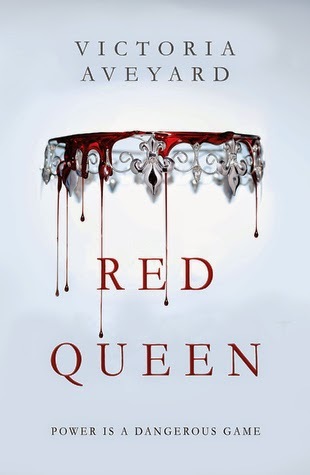 If your looking for an addictive read that is full of action and a real page turner I highly recommend picking up Red Queen. ~"They've spent so long at the top, protected and isolated. that they've forgotten they can fall." ~"The gods rule us still. They have come down the stars. And they are no longer kind." ~"In the fairy tales, the poor girl smiles when she becomes a princess. Right now, I don't know if I'll ever smile again."